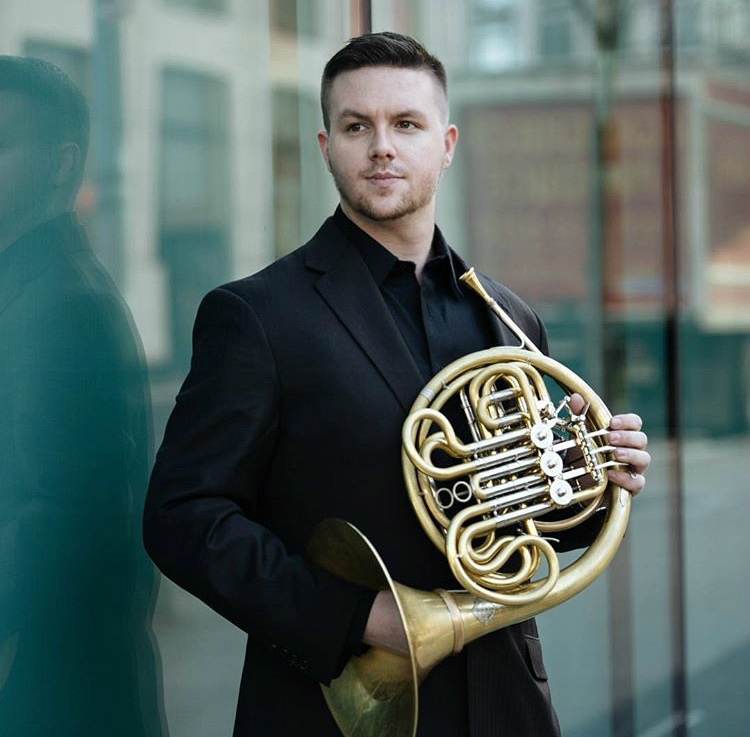 Hailed by the New York Times as "Outstanding" and an "Excellent Soloist", Trevor Nuckøls travels the globe as an internationally renowned horn soloist, chamber musician, and orchestral performer. He has concertized extensively in venues all over the United States, Scandinavia, Russia, Canada, Germany, Austria, Switzerland, France, South Korea, Colombia, and regularly in Japan, with his concerts broadcast on television and radio programs around the world. He began his first studies at the age of twelve on a single F piston horn with Michael Corcoran, and later with Professor Gene Berger at the Interlochen Arts Academy. Mr. Nuckøls earned his Bachelor and Master of Music degrees on a full scholarship from The Juilliard School, where he studied with Michelle Baker, and furthered his studies in Historical Performance on period instruments with R.J. Kelley. He additionally studied abroad with legendary horn players Frøydis Ree Wekre, Hermann Baumann, and Roland Berger. He completed his Postgraduate Degree in Horn Performance at the Universität Mozarteum in Salzburg, Austria, where he studied with world-renowned horn soloist, Radovan Vlatković. He covers the full range of the horn repertoire, and has been a featured soloist with the Münchner Bachsolisten, New York Concert Sinfonietta, Mozarteum Blaserphilharmonie, Camerata Salzburg, Österreichisches Ensemble für Neue Musik, Sarasota Orchestra, Camerata New Jersey, Axiom Ensemble, Music Academy of the West's Academy Festival Orchestra, and performed the New York Premiere of Oliver Knussen's Horn Concerto in Alice Tully Hall with Mark Wigglesworth and The Juilliard Orchestra. Mr. Nuckøls regularly performs as solo horn of the Munich Chamber Orchestra, and has performed as guest principal horn with the Bad Reichenhall Philharmonie, Philharmonie Salzburg, Miami City Ballet Orchestra, Saint Paul Chamber Orchestra, New York Classical Players, New York Symphonic Ensemble, Harrisburg Symphony, and Trinity Baroque Orchestra. He can be heard on the newly released recording, "Concertante!" feauturing Les Vents Francais released by Warner Classics. He performs and tours with the New York City based Frisson Ensemble, and has performed with The Chamber Music Society of Lincoln Center, Hora Decima Brass Ensemble, Novus New York, and the Jupiter Symphony Chamber Players. He has performed in cathedrals and sacred spaces across the United States with acclaimed organist, David Ball, as a member of Duo Corgano. Mr. Nuckøls has appeared as an artist at prestigious festivals including Salzburg, Marlboro, Lucerne, Pacific, Cartagena, Music Academy of the West, Tanglewood, Sarasota, Interlochen, and the New York String Orchestra Seminar. He won First Prize at The International Horn Society’s Premiere Soloist Competition, The Juilliard Concerto Competition, Music Academy of the West Concerto Competition, and was honored with the The International Horn Society's Barry Tuckwell Award, Interlochen's Young Artist Award, and the Minnesota Orchestra's Twin Cities Musicians Union Award. Trevor greatly values the importance of community outreach and bringing music to those who may not have access to classical music. He has awarded a Maxwell H. Gluck Fellowship, giving him the opportunity to play many concerts throughout New York City's hospitals, clinics, psychiatric wards, and other health care facilities. He has coached the Tokyo Junior Orchestra Society's horn section, and been a resident teaching artist at Cicely Tyson School of Performing and Fine Arts and at the University of Scranton. He believes in bringing positivity into teaching music, and inspiring his students through constructive and encouraging ideas to help them discover their special voice. Currently, Trevor Nuckøls performs as a horn player in the NY area, as well as soloing and performing with orchestras in Europe and Asia. Recently, Mr.Nuckøls joined the New York City based Frisson Ensemble, and participated in the Marlboro Music Festival, where he will return for summer 2019, and was featured on the newly released album "Concertante" feauturing Les Vents Francais and the Munich Chamber Orchestra. Please visit trevornuckols.com for more details and for contract information.